Designed specifically to soften the scales caused by psoriasis, this carefully formulated scalp oil makes their removal easy when shampooing your head. The wonderfully rich oil then goes on to moisturize the dry, irritated areas preventing itching and the unsightly redness. The all natural oil blends together more than 10 rich oils and herbal extracts, meaning you can feel safe in the knowledge the oil will be gentle on your skin. Use this amazing oil for between 7 – 14 days and you’ll not only feel the difference, but visibly notice it as well. For best results, we recommend using DermaSOVE scalp oil together with the DermaSOLVE Shampoo and treatment cream, although the oil can be used independently. 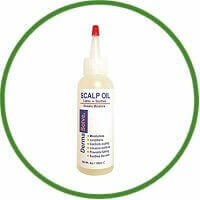 If you are looking for proven relief from the irritation caused by psoriasis on the scalp, then this oil is for you. All backed up with our 30 day money back guarantee.